Pina Colada recipe by Nabz at PakiRecipes.com. 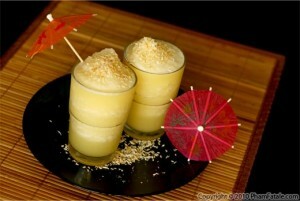 A delicious recipe for Pina Colada, with coconut cream and pineapple juice . In a blender mix 2 heaping tablespoons of the cream of coconut mixture (drain away the oil) with as much pineapple juice that can fit into the blender at a time. Blend on high speed until well mixed. Empty in a jug. Repeat until you have finished up all of the mixture. Serve chilled. Tastes even better with crushed/cubed ice but dont put ice in until you are about to serve! You dont want to water down the taste.